When most renewable energy advocates talk about energy storage they are referring to relatively short-term storage; everything from 15 minute storage to stabilize the grid and provide bridging power during sudden changes in output (for example the Notrees battery storage facility or the Beacon Power Flywheel facility in Pennsylvania) to 12-14 hours of Thermal Energy Storage which allows the Gemasolar Concentrated Solar Power Plant in Spain to run 7x24x365. 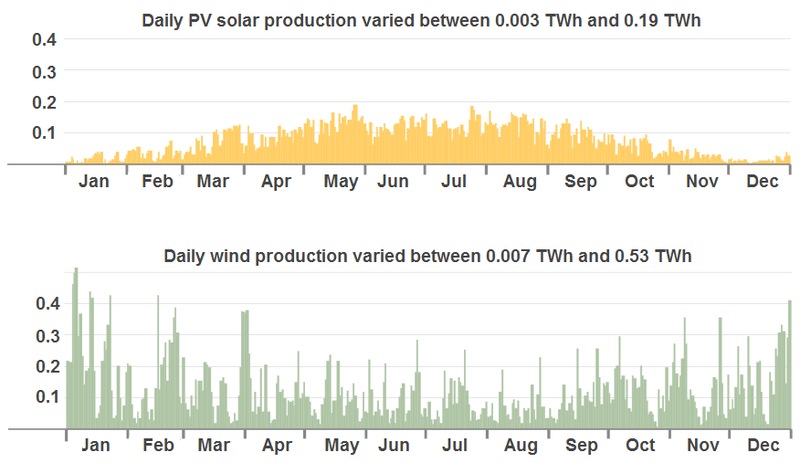 But if you examine the PV Solar generation from Germany on an annual basis it becomes obvious that there is also a long-term storage problem that needs to be solved. Summer PV Solar output is about 5 times greater than winter output. Any attempt to treat PV Solar in Germany as a consistent and reliable source of electricity would involve building out 5x more capacity than is really justified and then dealing with a huge surplus of electricity in the summer. This would be both highly inefficient and horrendously expensive. There are not a lot of options when it comes to really long-term energy storage that would span many months. However, there is one solution that would work and has been deployed in a limited way in real-world applications. That solution involves powering an electrolyzer to break water down into oxygen and hydrogen, then using the hydrogen in one fashion or another sometime later. 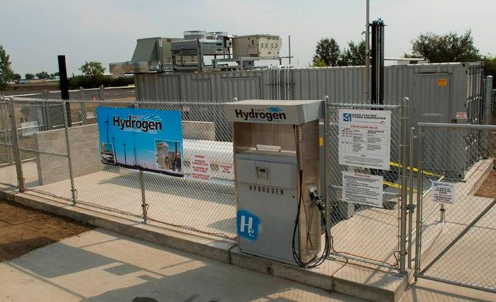 Research and development into the use of hydrogen storage of renewable energy has been going on since 2007 at the National Renewable Energy Laboratory (NREL) in Golden, Colorado. In partnership with Xcel Energy the NREL wind to hydrogen test bed has included a number of different components including different types of electrolyzers, fuel cells, hydrogen powered generators, and various interconnection technologies. Using hydrogen as a way to store energy is complicated with many ways to handle the flow of electricity between the electrolyzers and eventual end users of the hydrogen. The need to flip between AC and DC and to efficiently control the electricity flow within a “smart grid” represent significant challenges and only through tests of multiple configurations and using several different technologies will the optimal design be determined for deployment at scale. Research is ongoing. In an effort to evaluate some of the challenges that would be encountered in a commercial application of hydrogen storage technology the Basin Electric Power Co-operative entered into a pilot project with the Energy & Environment Research Center at the University of North Dakota. This project used real time dynamic scheduling to draw electricity from the Wilton Wind farm and feed that into an electrolyzer. The output hydrogen was stored in tanks and delivered directly to three pickup trucks and a tractor that were converted to use hydrogen fuel. As might be expected in a ground-breaking research project many issues were encountered, primarily around the reliability of some of the equipment components. Despite the challenges the project ran successully in a “production” mode from early 2008 until 2011 when the equipment was transferred to the NREL site in Colorado. A great deal of very valuable information was documented through this project regarding the full-cycle costs and practical application of hydrogen storage and use for the transporation sector. In remote Bella Coola British Columbia, Canada hydrogen storage is in use every day to reduce the amount of diesel fuel burned to generate electricity. The $7.4 million funding for the project was provided by BC Hydro, Sustainable Development Technology Canada, and General Electric Canada. Excess hydro electricity is used to power an electrolyzer which extracts hydrogen gas from water. This gas is compressed and stored in tanks for future use. Part of the excess hydro electricity is also stored in a flow battery which can provide very fast response both for storage and delivery of electricity. If peak demand exceeds the capacity of the hydro facility then the compressed hydrogen is fed into fuel cells which generate electricity without combustion making this an emissions-free system. Total hydrogen storage implemented in this project is 3.3 MW-hr which will deliver 100 KW for about 16 hours after accounting for energy losses in the fuel cells and associated processes. Overall end-to-end efficiency of the system is about 25%. That is, for every MW of hydro electricity used to produce the hydrogen gas about 0.25 MW of power is eventually returned to the grid via the fuel cells. A 75% loss may seem like a lot but the alternative is to let the water pass through the hydro dam spillways without generating electricity at all. That’s a 100% loss. And according to Sean Allen, chief engineer for Powertech, the prime contractor for the project, there are ways to improve the overall efficiency including using heat generated by the Electrolyzer, Fuel Cells, and compressor as part of a district heating solution. Even on the relatively small scale of this project construction costs were under $5/watt-hr ($7.4 million for effective delivery of 1.6 MW-Hrs). This compares quite favourably with the Notrees battery complex at $5/watt-hr and the Beacon Power flywheel technology at about $8/watt-hr. The big advantage for hydrogen storage systems is their ability to scale up for large amounts of storage by adding compressed hydrogen tanks. Theoretically weeks or months of excess energy could be stored in this way. The big disadvantage for this configuration of hydrogen storage system is the overall efficiency compared to batteries or flywheels. That implies that the electricity used to power the system must truly be surplus to any reasonable need and therefore is essentially worthless. Hydro power at night when reservoirs are full represents one viable source that fits this definition. PV Solar at mid-day is reaching that point in some jurisdictions as is wind in places like Texas where wind generators are sometimes offering electricity at negative prices. 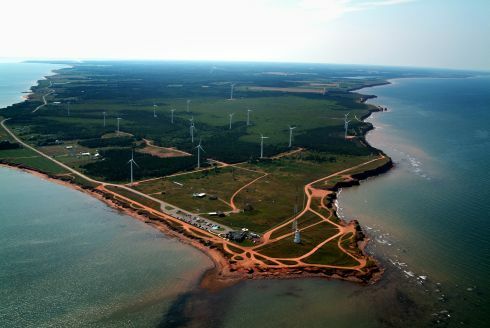 At the opposite end of the country another Canadian project has created a “hydrogen village” on the western tip of Prince Edward Island. The goal of this project is to demonstrate that remote communities can be completely self-sufficient in terms of electrical power without resorting to diesel generators. The wind farm produces electricity which is dynamically routed to satisfy both real-time demand as well as fueling an electrolyzer producing hydrogen which is stored in compressed form. When the wind is calm the stored hydrogen is used to fuel a back-up generator. The project started in 2009 and is ongoing. Most recently utility giant E.ON initiated a project based upon yet another approach to the use of hydrogen storage. In their facility in Falkenhagen, Germany they use surplus wind generated electricity to power an electrolyzer. Rather than storing the resulting hydrogen this facility injects the hydrogen into a natural gas pipeline where it will become part of the energy feedstock for residential or commercial heating. As with the Bella Coola project, the electrolysis and eventual combustion of the hydrogen to produce energy will result in overall end-to-end system efficiencies of about 25%. 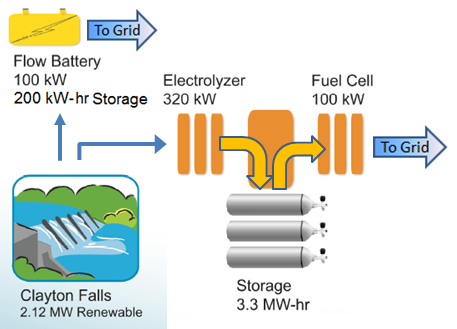 So is hydrogen storage the answer to our long-term energy storage requirements? At this point it is pretty much the only game in town. And despite the many challenges with this technology there have been enough “nearly ready for prime time” projects to warrant further research. Which brings me back to one of my ongoing frustrations. While “the world” has pumped literally hundreds of $billions into subsidies for solar panels and wind farms the amount dedicated to energy storage research and development is in the hundreds of $millions. Long-term storage using hydrogen has received a small fraction of that total. If we really want to rely upon renewables in the next few decades the funding priorities have to turn 180 degrees. 18-Oct-2016 Update: I recently came across the Hydrogen House project. Homeowner Mike Strizki decided he wanted to be completely independent of the local electrical grid. By installing a large number of solar panels, an electrolyzer, a number of large hydrogen storage tanks and a fuel cell he has achieved his goal. By storing excess solar energy during the summer months in the form of compressed hydrogen he can power his home all winter. At a latitude of more than 40 degrees North that is an amazing achievement. Hcellenergy is attempting to commercialize his approach. 17-Apr-2017 Update: Both the project in Bella Coola and the Hydrogen Village in Prince Edward Island have been abandoned with equipment being scrapped or re-purposed. Hcellenergy has not been able to secure either significant funding or any large project although a second Hydrogen House was developed in New Jersey in November, 2015. Green Energy, Schmeen Energy – Nobody Cares! If you have seen the movie “Jurassic Park” (and who hasn’t?) you might remember the scene where Dennis Nedry, the would-be thief of Ingen’s dinosaur embryos is having lunch with Lewis Dodgson, the potential purchaser of said embryos. 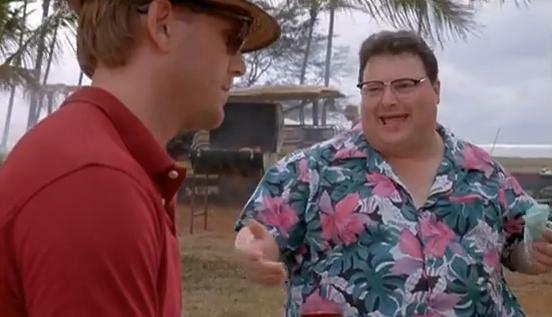 After his loud declaration that “We got Dodgson here” received no reaction or interest from the other restaurant patrons Nedry mocks Dodgson’s secretive behaviour with the comment “Nobody Cares!”. That’s how I am starting to feel about green energy. As someone that reads postings on this blog site and probably other similar sites you might take great offence at that statement. You care about renewable energy, you care about our need to stop burning hydro-carbons, you care about conservation. So do I. Opinion polls tell us that a majority of people want to reduce their impact on the planet and are even willing to pay a bit more for electricity and probably even manufactured goods that are more earth-friendly. Millions of people turn off lights and appliances on “Earth Day”. I recently travelled to Chicago and while on a stop-over at SEA-TAC I thought I would grab a magazine with some earth-friendly articles to read while I was waiting for my next flight. 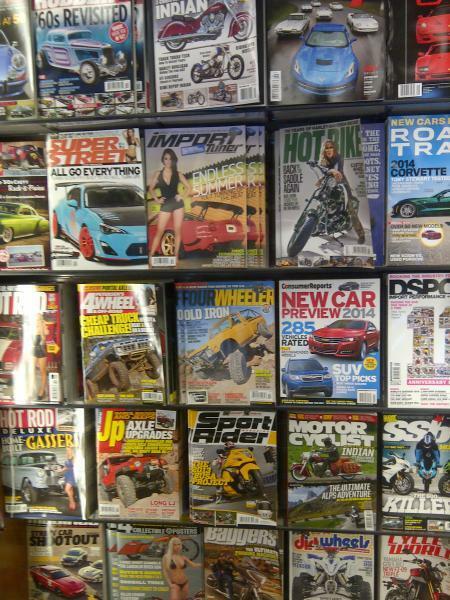 I walked into the closest newstand and viewed the racks of glossy magazines. There were dozens of magazines about lifestyles – houses, hair, happiness, hardship; not a single article on solar panels, energy conservation, living with less “conspicous consumption” or anything like that – quite the opposite really. 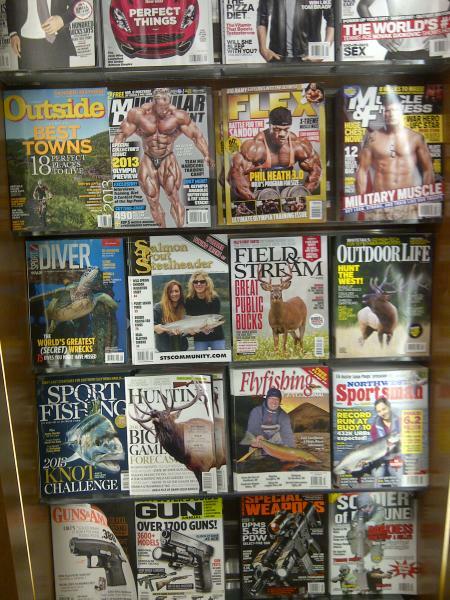 There were dozens of magazines about the great outdoors – hiking, biking, hunting, fishing; not a single article about deforestation/reforestation, urban bicycle commuting, or even climate change for that matter. There were dozens of magazines about cars – old cars, new cars, hot rods, and motorcycles; not a single article about electric cars (not even the Tesla! ), electric bikes, fleet fuel consumption, or hydrid technology. I am not lying when I tell you that amongst the hundreds of magazines in that shop there was not a single earth-friendly article to read. What does that tell me? It tells me that as much as most people have a vague intention to treat the earth better when it comes right down to it they are just not that interested in how that intention could be translated into action; i.e. “nobody cares”. And by “nobody” I mean the large majority of the inhabitants of spaceship earth. As someone that I suspect is pretty well informed about these topics I bet that you cannot answer the most basic of questions about your personal impact on the environment. What has been the actual fuel consumption of the car you drive over the past few months? (if you don’t drive an automobile bully for you!) Has it been trending up or down? If you drive by yourself to work (I do and I’m not proud to say that) have you investigated car pooling in the last year? (I have good intentions about car-pooling with a neighbour but haven’t got it done yet – I do bicycle to work about 1 day every two weeks). Do you know how much electricity your house consumes in a month? Has the consumption been going up or down over the past year? How does your house consumption compare to similar houses in your neighborhood? On hot summer days and cold winter nights do you know what is going on with demand vs. supply in your city or region? Have you ever been alerted to try and reduce your consumption of electricity (i.e. participated in a Demand Response event)? I confess that my answer to most of these questions is either “no” or “I don’t know”. Pathetic. But there you have it. At it’s core the problem is one of psychology and awareness. I discussed this at length in a previous blog posting. Now a start-up out of Arlington, Virginia is proving that getting electricity consumers to “buy in” to the concept of Demand Response can produce real results. Alex Laskey of Opower sums it up like this. So we can be successful in changing the way consumers view energy usage. Given that we really only have a problem for a few hours a day for a few weeks per year that is pretty encouraging. By way of example, a record heatwave on the eastern seaboard recently required the largest Demand Response in the history of the utility (PJM) to keep the lights on and the air conditioners humming. But memories are short and old habits die hard. We all need to be reminded on a regular basis that these issues won’t go away and need our regular attention. That’s why I keep writing posts for The Black Swan Blog. On September 22 there was a general election in Germany. In one of the most lack-luster campaigns in the post-war era Chancellor Merkel did everything in her power to keep issues and policies out of the news. The assumption was that if the German people had nothing to get excited about they would see no need for change and the CDU/FDP coalition would be re-elected. Other than the hickup caused by the FDP not getting representation in the Bundestag that turned out to be a winning strategy. So the question becomes, what happens to the German Energiewende – the policy that aims to restructure the German energy industry in order to transition to renewable energy sources – now that the election campaign is over? Over the past 15 years substantial government and ratepayer financial support mechanisms have encouraged the installation of residential and industrial roof-top Photo-Voltaic (PV) solar panels as well as the development of wind farms. As a result Germany has racked up an impressive scorecard of renewable energy statistics and achieved some very notable milestones. As of the end of 2012 Germany had more than 30 GW of “nameplate” PV solar capacity and more than 30 GW of wind generation capacity. For a few hours around noon during windy spring days renewable energy regularly meets up to 40% or more of total German electrical requirements. Unfortunately there is a large dark cloud towering above this silver lining. Despite ever-increasing generation capacity, wind and solar sources have failed to consistently produce power when it is needed or significantly reduce German dependence upon traditional thermal generation assets (coal and natural gas-fired plants and nuclear plants). The graphs below demonstrate the problem (these are taken from a comprehensive report published by the Fraunhofer Institute). The variability of wind production is such that there are many times when virtually no generation from wind is occurring – sometimes only for a few minutes, sometimes for many consecutive hours. PV Solar generation also displays a great deal of variability and of course is not available after sunset when electricity demand is still quite high. The seasonal variation of PV generation in Germany is even more disturbing with winter values less than a quarter of summer values. With renewable generation varying by an order of magnitude across the seasons and sometimes within a few hours at night how has the German electrical sector managed to keep the lights on? By depending upon traditional thermal generating assets which must be kept fully operational as “spinning reserves” that are available at all times to back-up renewable sources. Having “spinning reserves” is not unusual in any electrical generation fleet. Extra generation must be available in case a large thermal plant “trips off” or is shut down for maintenance purposes. But having 40-50 GW of spinning reserves to provide generation continuity through a regional storm event that could radically alter both cloud cover and wind speed is unique in the world and is destined to get worse if Germany continues to deploy additional PV solar and wind capacity. As wasteful as it might seem, it would be physically possible to maintain all of the traditional thermal assets on standby. However, such a strategy is not possible from an economic point of view. With renewables getting preferential access to the grid, Germany’s utilities are finding it impossible to run thermal generating stations profitably. In an ironic twist for green energy advocates, German utilities have turned back the clock, abandoning their ultra-efficient Combined Cycle Gas Turbine (CCGT) generation plants (some less than 10 years old) in favour of coal plants that emit much more CO2 per unit of electricity generated and are also the source of toxic pollutants. Even with this “bottom line” approach these utilities continue to lose money at many of their plants. Moody’s recently re-iterated their negative outlook for the profitability and credit ratings for these firms. Some would say that these utilities are aging dinosaurs whose time has past. The sooner they disappear the better. What these folks may not realize is that these dinosaurs, with their reliable thermal generation assets, are regularly coming to the rescue on cold calm nights when their full fleet of generation assets has to be deployed on short notice. If plans to close many thermal generation plants go forward then Germany will actually have to rely upon the renewables and that is not likely to be a pleasant experience. Another major issue that must be addressed is the rapidly increasing cost of the Energiewende. As more and more renewable generation comes on stream, all earning guaranteed above-market prices, an increasing proportion of the monthly bills consumers have been paying is going towards these EEG payments. Germany industrial electricity rates are also being forced up by the inclusion of renewables and are starting to impact the competitiveness of German companies. Chancellor Merkel has pledged to significantly reduce renewable incentives. It remains to be seen how extensive these reductions will be and what impacts will actually materialize for an industry that regularly threatens it will collapse if incentives are reduced. The final and very thorny issue that will face the German government now is what to do about plans to decommission the remaining German nuclear plants. In order to replace the more than 12 GW of reliable nuclear generation capacity there are plans to build up to 10 large coal-fired generation plants. It is very difficult to imagine how Germany can meet it’s CO2 emission reductions under this scenario. Given the credit ratings of the utilities that will have to build these plants and the uncertainties caused by a continued pro-renewables policy it is also difficult to see how the construction of these plants will be financed. The economic disruption and loss of skilled jobs associated with this transition will also be problematic. So what is the most likely outcome? In my opinion the backlash against renewable subsidies that is beginning to become evident throughout Europe will turn into a contagion. With growing skepticism about the threat of global warming there will be less public appetite to absorb the seemingly never-ending cost increases associated with renewables. As solar and wind become less attractive investments demand will decrease significantly leading to fierce competition for those customers and projects that are able to follow through on the commitment to renewables. Much of the momentum built up over the past 15 years could be lost in a relatively short time. I also think that the German policy towards nuclear energy will flip-flop once again in order to support the country’s commitment towards meeting Kyoto targets. The most likely change will be an extension to the length of time that some plants will remain operational. Making the transition to a sustainable energy environment will not be easy and cannot succeed without major advances in energy storage. A more holistic approach that addresses the reliability and variability issues associated with renewable sources is necessary. I have outlined the major components required in my Sustainable Energy Manifesto.